Creative services business KOJO has announced it will join forces with Hedone Productions to create an exciting new film and television production business under the KOJO Entertainment brand. Hedone’s producer, Kate Croser will join KOJO as Head of Production and Development, bringing Hedone’s existing slate of projects over to KOJO. Fellow Hedone principal Sandy Cameron (The Infinite Man, Boys in the Trees, Sam Klemke’s Time Machine) will also produce Hedone’s slate at KOJO and continue to work as a freelance screenwriter. A highly experienced producer, Ms Croser’s credits include the critically acclaimed time travel comedy The Infinite Man; AACTA nominated SBS cult comedy series Danger 5; ABC documentary film Michelle’s Story (winner of the 2015 Adelaide Film Festival Audience Award); and the Australian-Iranian feature film collaboration My Tehran for Sale. Kate is a current member of the Board of Directors of the South Australian Film Corporation, and serves as a feature film representative on the council of Screen Producers Australia. Dale Roberts, CEO of KOJO sees this as an important step in the expansion of KOJO’s development and production strategy. “I am excited to have Kate Croser join KOJO Entertainment as Head of Production and Development. Our companies saw an opportunity to play to each others strengths by combining our experience, network and creativity. Kate has extraordinary instincts for developing and producing engaging content. Her depth of experience will invigorate our slate as well as offer our partners new opportunities to collaborate,” said Mr Roberts. Kate Croser said “KOJO are a highly experienced film and entertainment company with a national presence and strong international partnerships. I am delighted to bring Hedone’s slate of projects to KOJO Entertainment and look forward to building upon the strong foundations at KOJO to create exciting screen content for national and international audiences,” said Ms Croser. To further strengthen KOJO’s growth strategy Kate Butler joins Kate Croser as Production and Development Executive. Ms Butler has spent the past ten years leading KOJO’s post production business and has worked on national and international projects including, The Lucky One and No Reservations for Warner Bros and the highly acclaimed The Babadook. In her new role Ms Butler will work closely with Ms Croser to develop and produce KOJO’s production slate as well as oversee the company’s production investment portfolio. Dale Roberts, CEO of KOJO commented on Ms Butler’s appointment. “As with any businesses, it is vital to have the right people in the right roles. Kate Butler has spent the past decade working with our clients and has a deep understanding of the opportunities we will pursue as a business. “We have a solid slate of film and television projects in the works and I am thrilled to have both Kate Croser and Kate Butler working together to drive a new chapter for our business and also make a significant contribution to the Australian and international screen industry.” concluded Mr Roberts. 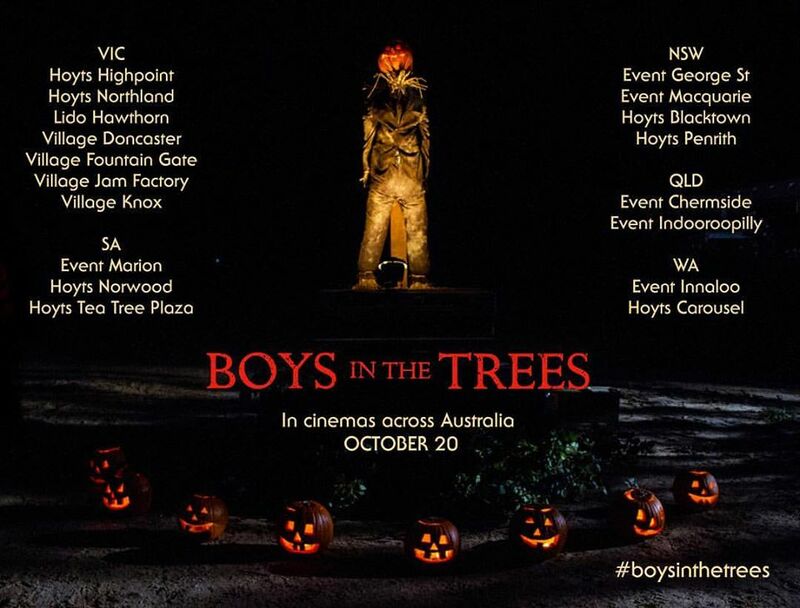 BOYS IN THE TREES, the new feature written and directed by Nicholas Verso, produced by John Molloy of Mushroom Pictures and co-produced by Hedone Productions’ Sandy Cameron and Kate Croser is now in cinemas across Australia. Please click below for the list of participating cinemas. 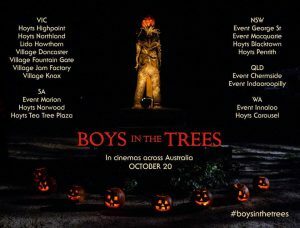 BOYS IN THE TREES, the highly anticipated feature written and directed by Nicholas Verso, produced by John Molloy of Mushroom Pictures and co-produced by Hedone Productions’ Sandy Cameron and Kate Croser, will have its world premiere In Competition within the prestigious Orizzonti section of the Venice Film Festival. The film will be released in cinemas nationally on 20 October 2016, and tells the story of two estranged childhood friends who reunite on Halloween 1997 and embark on a surreal journey through their memories, dreams and fears. Meryl Tankard’s Michelle’s Story, produced by Kate Croser, has picked up three nominations at the 2016 South Australian Screen Awards, including Best Short Film and Best Documentary. As South Australia’s highest film accolades, SASAs celebrate South Australian talent in the film industry. Also nominated is Alies Sluiter for Best Composer, shared with NSW based composer Elena Kats Chernin. The winners will be announced at the gala award night on 13 May at the Mercury Cinema in Adelaide. Michelle’s Story premiered at the Adelaide Film Festival in October 2015 where it won the Audience Award for Best Short Film. It was also broadcast nationally on ABC in March 2016. A study guide will be available mid 2016 for educational use. Hedone Productions is a finalist for the Media Super Production Business of the Year, awarded to a production business that has produced an outstanding project or body of work, which has contributed to the advancement of the screen industry over the last 12 months. This follows on from Hedone’s nominations for Best Feature with THE INFINITE MAN and Best Comedy Television production with Dinosaur for DANGER 5. The awards take place at Crown palladium, Melbourne on 19 November during the Screen Forever Conference.